Bust out the popcorn, folks. 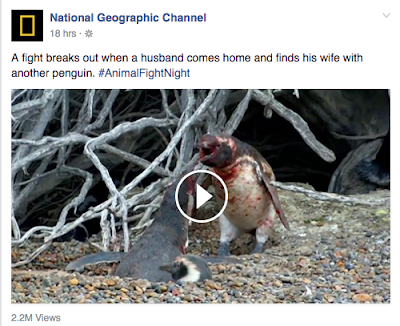 National Geographic just rolled out the fight video to end all fight videos. Well, not really. But you gotta watch it and then read the comments anyway. That's what the popcorn's for! 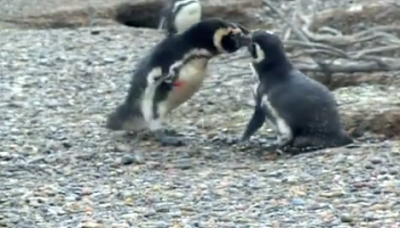 Mr Penguin came home from fishing one day to discover that his wife was with another penguin. Let's call him Pablo. That's him up there with Mrs Penguin. So Mr Penguin and Pablo get into a fight. 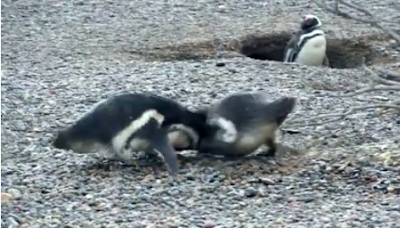 They beat each other up with their beaks and flippers. 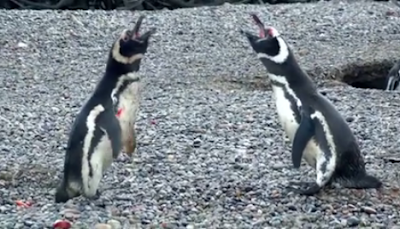 And the neighbors are all like, "Fight! Fight! Fight! Fight!" 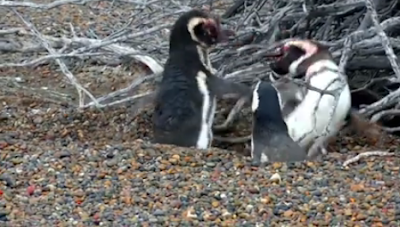 Then, before they get to the point where they might actually kill each other and they're like, "Dude, we don't have to kill each other over a ho, right?," they both call for Mrs Penguin to choose between them. And to everyone's shock, she picks Pablo. It gets worse, guys. Right in front of her husband, she takes Pablo's flipper and says, "Come home with me." Home being the house Mr Penguin built for her, where all the adultery had been happening! Grabe! This drives Mr Penguin insane and he goes in for the kill. He chases the cheating pair, drags Pablo out of his house—yes, his own house!—and proceeds to peck his eyes out. Mrs Penguin watches as the two men in her life battle it out. 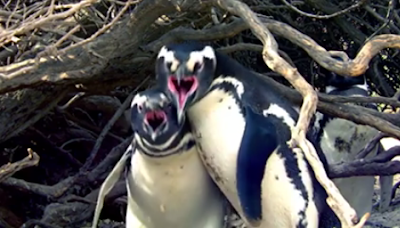 But Pablo—either he's too macho or well rested because his day had been spent in bed with Mrs Penguin while Mr Penguin had been out all day swimming and hunting in the ocean, ya know, being a good husband!—Pablo wins. Mr Penguin calls on his wife to stay true to the penguins-mate-for-life thingie but Mrs Penguin says, "Go away! I LOVE HIM!" 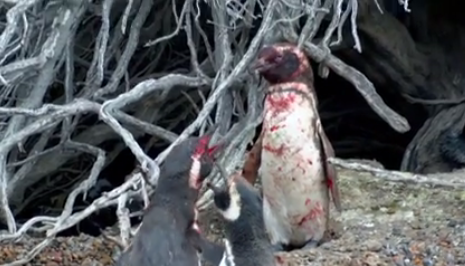 And Mr Penguin walks away, bloody, defeated and without a wife and home. The end. Mr Penguin better get a DNA test. So true! Don't forget the hashtag: #AnimalFightNight! May twist sa end. Uso yan ngayon sa movies. Clever! I totally LOL'd because nerd. Well, Heidi, you're in for a treat because Mrs Penguin just opened up on Twitter! Sorry I called you that, Mrs Penguin. Well! Love in a hopeless place! What do you think??? Team Mr Penguin vs Team Mrs Penguin? I can't decide! It's cute and funny, pero masakit sa puso bes, bloody war! hehe. LOL at the comments. 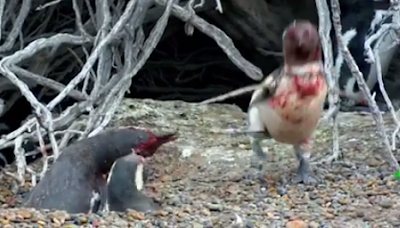 Two thumbs up for Mrs Penguin airing her side of the story. 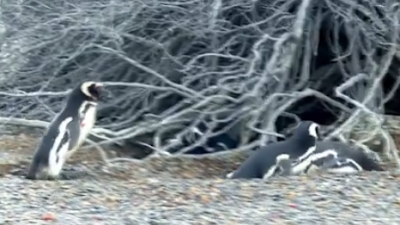 Don't judge a penguin by its errrr flippers?